If a picture is worth a thousand words, a video must range into the millions. Videos break the barrier between telling and show us things, ideas, and images that transform an experience – they bring us in. Through video, our panel of experts has reached hundreds of thousands, entertaining and educating along the way. Join us for a look at how video emerged as the latest medium for the age-old tradition of storytelling. 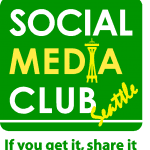 Join Social Media Club Seattle (SMC Seattle) at Seattle City Hall on Tuesday, June 28 for a panel featuring Jason Reid of Sonicsgate fame, CommonCraft founder Lee LeFever, and Ben Crawford of Epipheo Studios. SMC President-elect Shauna Causey will moderate the panel of experts which will touch on storytelling in the video age, creating great content and using social media to spread their messages and engage viewers. Time – 6:00 p.m. – 9:00 p.m.
Adam Brown (Sonicsgate) – Adam is a dedicated film producer with a diverse background in content creation, media campaigns, digital marketing and event management. He graduated from Western Washington University with a degree in Communication and Journalism, writing articles for magazines such as Klipsun, What’s Up! and The Planet while playing guitar in local rock, funk and hip-hop bands. After moving back to the Seattle area and gaining experience in marketing positions with IntelliTax Software, Loud Technologies and Microsoft, he became Media Director for the nonprofit group Save Our Sonics in 2007. In 2009, he produced, co-wrote and co-edited the Webby Award-winning feature documentary film Sonicsgate: Requiem for a Team (2009), going on to start up his professional media company Press and Promotion later that year. In addition to creating media content for corporate clients, Adam is currently producing several independent film projects and leading the promotional campaigns for recent films such as Back to the Garden: Flower Power Comes Full Circle (2009) and the Emmy® Award-winning Man Zou: Beijing to Shanghai (2010). Lee LeFever – Lee LeFever is the founder and principal of Common Craft, producers of the popular series of paper-and-whiteboard video explanations. Since 2007 Common Craft’s videos have been viewed over 35 million times online and the company has worked on custom video projects with LEGO, Visa, Intel, Ford and Google among others. Common Craft’s current focus is making videos that help educators shine. Lee and his wife Sachi are Common Craft’s only employees and work from their home studio in Seattle’s Mount Baker neighborhood. Ben Crawford – Ben Crawford is one of the co-founders of Epipheo Studios which is one of the most popular and successful producers of explanatory videos. They call their videos “epipheos” which is a combination of the words epiphany and video. Since they released their super popular epipheo “What is Google Wave” they have been able to sign some of the top web companies in the world as their clients, including, Facebook, Microsoft, Intel, NBC, etc. and of course Google on several occasions.